Eight (8) races scheduled. If 6 races are sailed, each boat’s series score shall be the total of her races scored excluding her worst score. This changes RRS A2. 14:00 – 19:00 Check In, Late Registration and Measurement 16:00 Practice Race weather permitting. 18:30 Race Committee Meeting with PRO / Regatta Chairperson. 19:00 Safety Boat Meeting with PRO / Regatta Chairperson. 07:30 – 08:30 Check In, Late Registration and Measurement. 07:30 Continental Breakfast, coffee, donuts and bagels. 09:00 Build your own lunch buffet table opens for one hour. 09:30 Skippers Meeting with Regatta Chair & PRO. 10:00 Warning Signal / Harbor Gun. 07:30 Continental Breakfast, coffee donuts and bagels. 09:00 Build your own lunch buffet table opens for one hour. 09:30 Harbor Gun. 19:30 Dinner at Chautauqua Lake Yacht Club. 07:30 Continental Breakfast, coffee donuts and bagels. 09:30 Warning Signal / Harbor Gun. TBD Lunch buffet to open as soon as possible after final race. TBD Awards ceremony as soon as possible after final race. Eight (8) races are scheduled. The completion of three (3) races constitutes a Regatta. No more than two races will be sailed back to back. On Saturday August 8, 2015 no races will start after 1400. If six races are sailed, each boat series score shall be the total of her race excluding her worst. This changes RRS A2. Top 5 Skippers, Top 5 Crews, Top Vintage Boat Skipper, Top Rookie and Top Master. (Master is a skipper whose age is 65 or greater as of August 6, 2015). Entry fee for registrations received on or before July 31, 2015 is $250 for boats whose skipper was born on or before August 6, 1985 or $210 for Skipper born after August 6, 1985. Entry fee for registrations received after July 31, 2015 is $325 for boats whose skipper was born on or before August 6, 1985 or $285 for Skipper born after August 6, 1985. All skippers must be Regular Members of the NCESA and need to join before the regatta at www.e-scow.org. Entry fees cover the cost of running the regatta, trophies, continental breakfast & lunch for each day of racing. Online Regatta Registration, Social Packages at NCESA web site www.e-scow.org. Pre-order Regatta Wear is available online at http://www.sailclyc.org/. If mail in registration is preferred; payment must be issued to CLYC E-Fleet along with some basic information to Mrs. Terry Turner, 105 East Terrace Avenue, Lakewood, NY 14750. Measurement takes place at the Chautauqua Lake Yacht Club from 14:00 – 19:00 on Wednesday August 5, 2015 & from 07:30-08:30 Thursday August 6, 2015. Boats not having a weight sticker or a lead seal shall are not eligible to compete and will have to be weighed and weights sealed. Sail Serial numbers to be used for the regatta must be declared and recorded at registration. Spot checks by judges may take place at any time. Sailing Instructions will be available online no later than August 4, 2015 at: http://www.sailclyc.org/ as well as at the Check In / Late Registration table. The Chautauqua Lake Yacht Club will attempt to locate housing on a first come first service basis but no guarantees are implied. Historically; CLYC has housed 100% of all requests made in advance. Please direct any and ALL Housing Requests to Heather Turner at: hahturner@gmail.com or Ricky Turner at: returner3@gmail.com. A list of local hotels can be found at http://www.sailclyc.org/. Buffets and evening Social Events. Continental Breakfast: begins at 07:30 at the Chautauqua Lake Yacht Club each morning and includes: Coffee, Juice, Bagels, Donuts and Assorted Fruit. The cost of which is included in your registration fee. Lunches: A “build your own lunch” buffet table will open on Thursday & Friday from 09:00-10:00. Saturday lunch buffet will take place as soon as possible after the final race. The cost is included in your regatta registration fee. The Social Events include the Thursday & Friday night banquet dinners along with live entertainment on both nights. Cost is $82.50 person . Regatta specific and other sailing apparel items are available by pre-order. 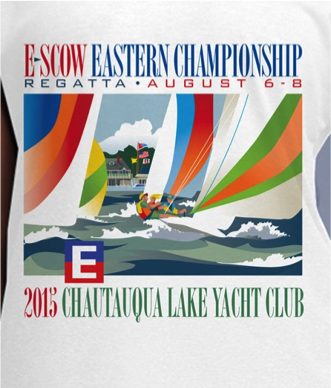 Please look for the E Scow Easterns new design and logo on the web site at: http://www.sailclyc.org/. Pre-order online for pick up at registration is recommended as a very limited amount of merchandise will be available for sale during the event. A link to this website can be found at: http://www.sailclyc.org/. Any questions concerning Regatta Wear may be directed to Rebekka Hogan at: rebekka@rebekkahogan.com.